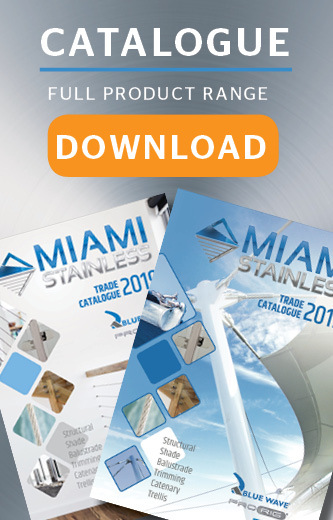 Miami Stainless range of easy to install Stayput™ Vertical Dome Hooks are specifically designed to secure vertical or angled fabrics to a flat surface using Stayput™ Shock Cord Loops. Applications include fastneing cafe blinds to sidewalks or eating areas. Stayput Dome Hook 60mm Black vertical Stayput Fittings are designed for securing fabric to a fla..
Stayput Dome Hook 60mm Cement Vertical Stayput Fittings are designed for securing fabric to a fl..
Stayput Dome Hook 60mm Clay Vertical Stayput Fittings are designed for securing fabric to a flat..
Stayput Dome Hook 60mm Green Horizontal Stayput Fittings are designed for securing fabric to a f..
Stayput Dome Hook 60mm Ivory Vertical Stayput Fittings are designed for securing fabric to a fla..
Stayput Dome Hook 60mm Terracotta Horizontal Stayput Fittings are designed for securing fabric t..
Stayput Dome Hook 60mm White Vertical Stayput Fittings are designed for securing fabric to a fla..